ROGER ARONOFF: Next up is Clare Lopez. Clare is a former CIA officer. She is a strategic policy and intelligence expert with a focus on national defense, Islam, Iran, and counterterrorism issues. Currently a Senior Fellow at the Center for Security Policy, the Clarion Project, and the Canadian Meighen Institute, and Vice President of the Intelligence Summit, she formerly was a career operations officer with the Central Intelligence Agency, and a professor at the Centre for Counterintelligence and Security Studies, Executive Director of the Iran Policy Committee from 2005 to 2006, and has served as a consultant, intelligence analyst, and researcher for a variety of defense firms. She was named a Lincoln Fellow at the Claremont Institute in 2011. Clare Lopez. CLARE LOPEZ: Well, thanks so much, Roger. And thanks to all of you for being here. Our appreciation, of course, to the Heritage Foundation for the use of their facilities here today. It is all much appreciated. 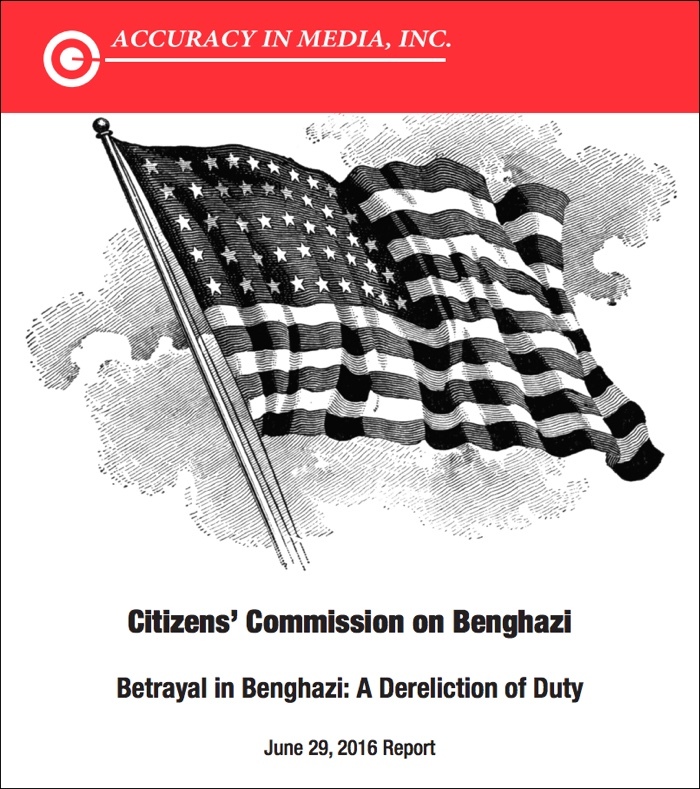 I want to follow on what Colonel Brauer just spoke to you about and explain to you a little bit about my focus, and my intent in being part of this Benghazi Citizens’ Commission. It’s a little bit of a more broadly based set of concerns that I have, although the investigation into what happened actually that night on the ground in Benghazi–why no help came for our beleaguered military and other staffers at both the ambassador’s compound and the CIA Annex–is critical. I want to focus on two issues, though. One has to do with why, why were there in Libya in the first place. What we were doing in Libya, and in Benghazi, in the first place. This goes back to 2011. I think it is pivotal that we get at this information, because it is indicative of where the United States’ foreign policy has gone since then. I think the path, I think the green light, if you will, even, was given by President Obama in his 2009 speech in Cairo, Egypt, when he green-lighted the Islamic uprising that would follow over the next two years. What happened in Libya was a follow-on to that green light, as well as what happened in Egypt, where the Muslim Brotherhood rose up and seized power for a time. But back to Libya. In Libya, there was a sovereign government in place that was no national security threat, whatsoever, to the United States of America in 2011. It was a brutal, multi-decade dictatorship with a human-rights record that was appalling by Muammar Gaddafi towards his own people. But no threat to the United States. Muammar Gaddafi had given up his WMD some years before. He had also begun to cooperate with the United States, and with the West, to keep al Qaeda in the Islamic Maghreb, AQIM, down. He had al Qaeda jihadis in his jails. And yet, in March of 2011, the United States, together with NATO allies–Italy, France, and others–decided to intervene in Libya. Why? To assist al Qaeda militias to overthrow a sovereign government that was no threat to the United States. Let me repeat that. The United States intervened in Libya in early 2011 on the side of al Qaeda militias: Ansar al Sharia, the Libya Islamic Fighting Group, Libya Shield, and others–very well known to our Embassy in Tripoli, to our then, not-yet-Ambassador, but Christopher Stevens, who was named in early 2011 the envoy to the Libyan revolution, to the Libyan rebels. These were the people that he was there to assist: al Qaeda, al Qaeda militias. I want to know why. I want to know why the United States flipped, barely a decade or more–a little bit more than a decade. After 9/11, the United States is now intervening in a sovereign country to assist al Qaeda to overthrow that government. So that is one purpose for this Commission that I would like to set our purpose towards. The second thing, and Colonel Brauer alluded to this as well. For me, it is very important to understand why and how the coverup occurred after the events of September 11, 2012. The coverup, that as Colonel Brauer mentioned, involved our Administration, explicitly and repeatedly through spokesmen, through Ambassador Susan Rice at the United Nations, through Secretary of State at the time Hillary Clinton, and others in the Administration, blaming a horrendous little video. By the way completely truthful. Innocence of Muslims was badly made from every perspective you can think of, especially technically, but everything in that video was taken directly out of the Koran, the Hadiths, the Sira–that is, the biography of Mohammed. Every single incident in that short little video trailer was true–according to Islamic doctrine and belief, that is. But I was to know why the Administration chose to take that video, which was indeed causing havoc in other places around the world–demonstrations and protests, very violent, and Cairo and other places. Eventually three dozen of our embassies and diplomatic facilities around the world were under demonstration or protest because of this video–but not in Benghazi, not in Benghazi. Why did the Administration then seize upon that video to be its excuse for what happened there? Well, I have an idea, and that idea is that the United States government, for a number of years now, has been working very closely with what is called the Organisation of Islamic Cooperation, the OIC. It is a 57 member head of state organization, second in size only to the United Nations itself, and includes 56 member states plus the Palestinians, makes 57 members, and it has an agenda. It’s top agenda item for the ten-year period that began in 2005 runs until 2015; it’s published online, it’s at their website. Top agenda item for the OIC is criminalization of the criticism of Islam. That is, to incorporate into not only its own member state criminal codes, but also elsewhere, in particular the United States legal code, the criminalization–criminal penalties for insulting Islam. Our Department of State, then-Secretary of State Hillary Clinton had been working very closely for the previous two years with the Secretary General of the OIC, the Turkish Secretary General Ekmeleddin Ihsanoglu, and even had him invited to the United States where she hosted him in the Department of State in December of 2010 for discussions on how the United States could align its criminal code with the OIC’s objective to criminalize criticism of Islam. So, I think we need to look at that aspect of the coverup as part of the reason, or perhaps part of the Administration’s reason for seizing upon that horrific little video as the excuse for what happened in Benghazi, for the attack–which was no demonstration, was no protest gotten out of control. It was a military assault from the beginning, as Colonel Brauer has described. But why did the Administration seize on the video? I think it had a lot to do with this particular agenda item. By the way, the United States sends an envoy. We are not a member, but we send an envoy to the OIC. His name is Rashad Hussain. So, I will leave it at that. Those are the two issues that I am most concerned with as a member of this esteemed group of colleagues, among whom I am very honored to be. Thank you.